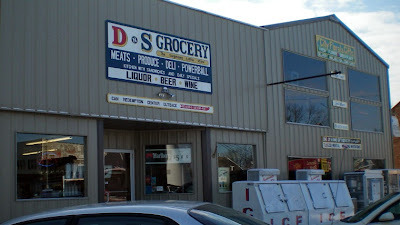 This post is titled D & S Grocery in Melcher-Dallas, but the tenderloins are supplied by Northcote Meats, a locker located next door. Northcote Meats handmakes these in their locker, and supplies restaurants in the area. Many tenderloin places get their meat supplied from a local locker, some have their pork loins cut there. An award winning tenderloin restaurant may even have their supplier tenderize the loins after having cut and trimmed off site. 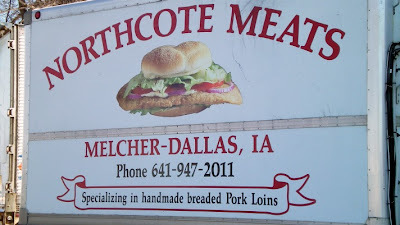 Northcote is not some giant food processor, its just a small locker employing locals in Melcher-Dallas and specializing in tenderloins. 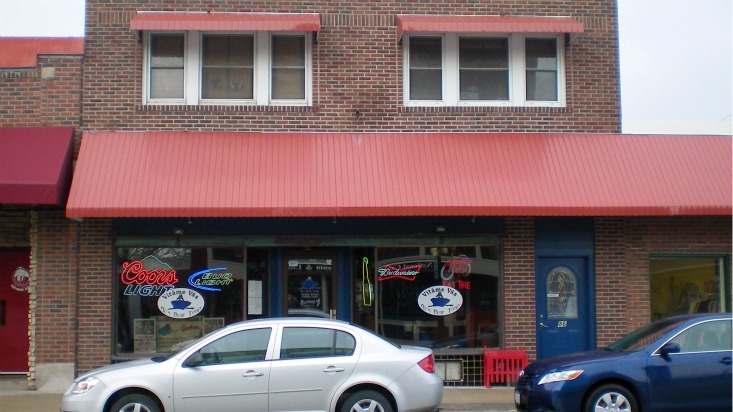 Location: 104 SE Main in Melcher-Dallas, Marion County, Central Iowa about 35 miles Southeast of Des Moines. Directions: Take County HWY S45 about nine miles south from the Highway 5 and Highway 92 intersection south of Pleasantville on the road to Knoxville. 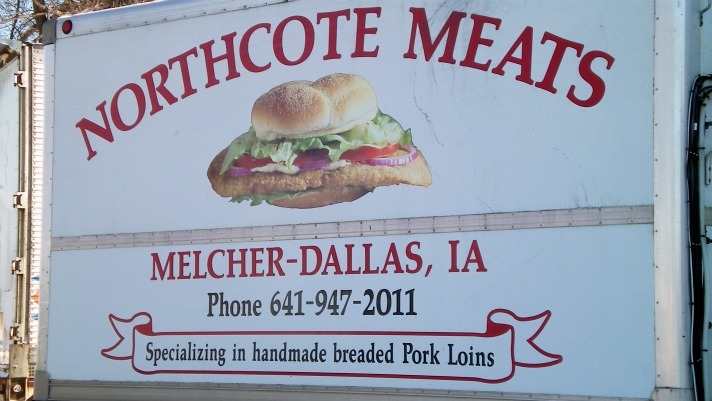 Online at: Northcote Meats has a website HERE. 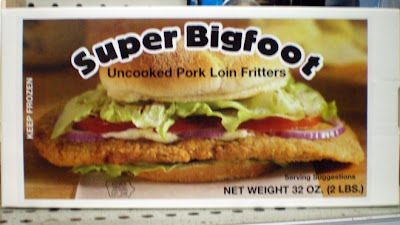 The Bigfoot Tenderloin: I am pretty sure I've eaten these before at more than one place in the area around Melcher-Dallas. The shape was nearly a perfect oval from above, although one side was slightly thicker than the other. The meat felt like seven ounces or more when lifting the sandwich. The meat was a bit on the thin and gray side, but felt like it was from one piece of meat. 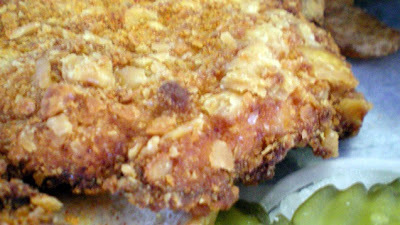 The texture of the breading had a good crunch, but with no seasoning or spices in the mix. The whole thing felt like it needed all the fixings plus ketchup and mustard to make it taste alright. 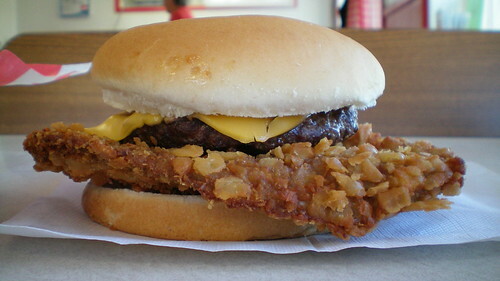 Also on the menu: There is a smaller tenderloin, tons of fried stuff and burgers. The rural Iowa versions of Mexican fluffy tacos and nachos seemed popular with the locals. Service: The D & S Grocery has two ladies working the counter with another in the kitchen area, food taken to your table when its ready. Northcote next door will process your pork, beef, or deer. Ambiance: This is a small town grocery and fast food stop which had a flow of locals in the small dining area. Final Thoughts: My trip to Melcher-Dallas to check this out didn't change my mind about these things. 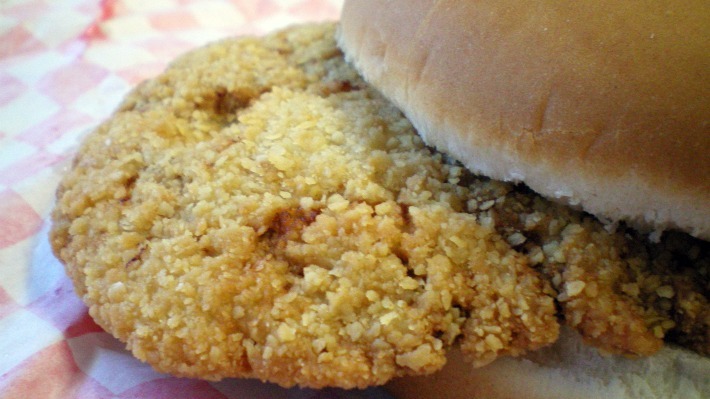 They only seem fit for places that can't make one on site or don't have the combination of time, trained labor, or other things necessary to make a good tenderloin. This The Bigfoot is better than some tenderloins at places that don't make one right, and I guess its preferable to any other premade tenderloin I've found. 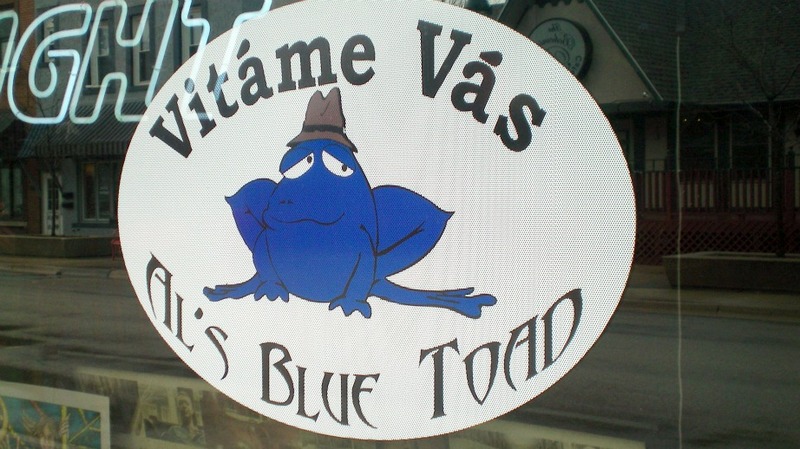 Driving down the main street of the Little Bohemia neighborhood in Cedar Rapids brings a visitor past several small businesses with signs in Czech. 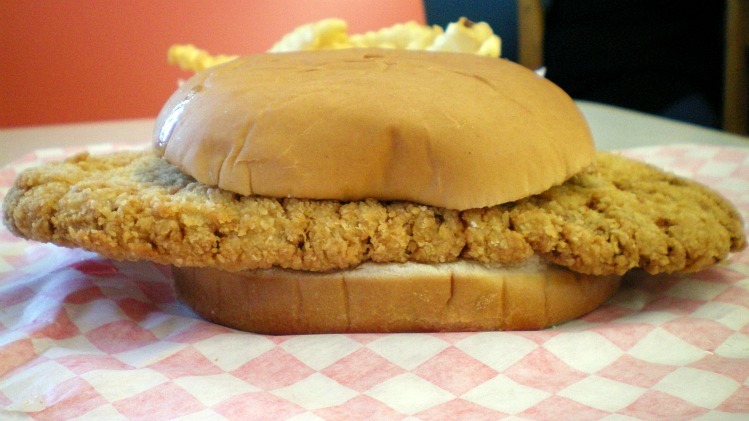 I never got around to trying any tenderloins here before the big flood came through. Over the years since 2008 many businesses have reopened, while others have decided to make major changes or move on. The owner of the old Zindrick's Restaurant used the time after the flood to reorganize and remake the restaurant. The space is now home to both the Blue Toad, and the adjacent space is now the Red Frog operated by his sister. Location: 86 16th Ave. SW in the Czech Village area of Cedar Rapids. Directions: The closest exit from 380 is at Wilson Ave, I think there are signs pointing the way to the Czech Village area. 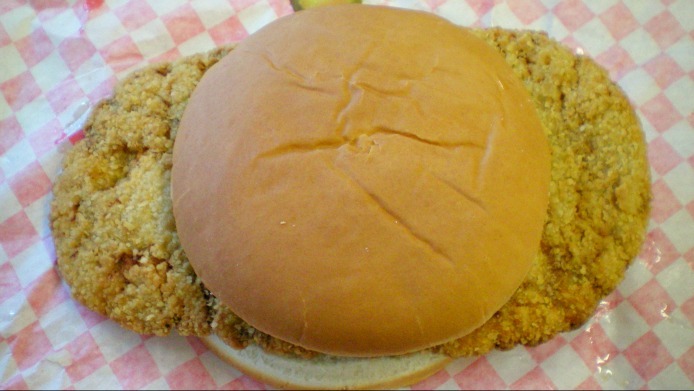 The Tenderloin: Described on the menu as the Cajun Breaded Tenderloin. 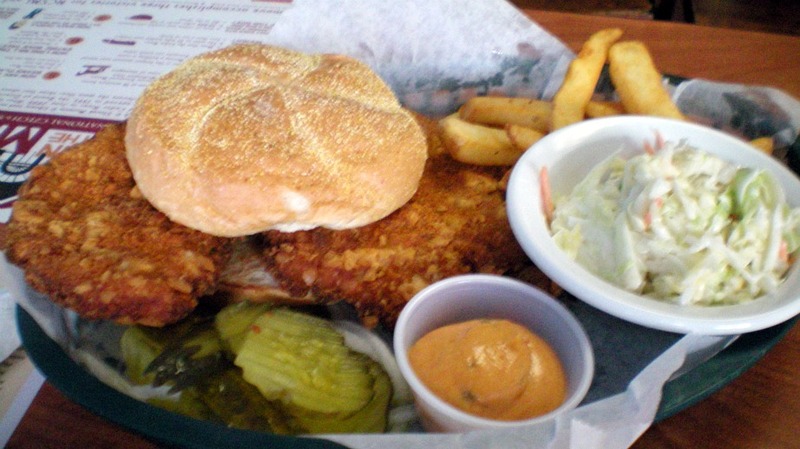 It felt like they took and regular tenderloin and tossed it in a mix of cajun seasonings. It tasted like a lot of salt on the outside of the breading. The white pork meat had been pounded into a butterfly shape visible in the pictures. Edges of the sandwich easily tore off the center and felt soft while chewing. 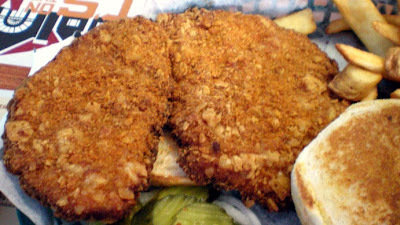 The seasoning overpowered the breading but had some great spiciness, the Cajun mayo was good for the thick cut fries. Served with all the fixins on a soft toasted bun. Overall 8.2 out of ten. Price: $8.55 with fries and slaw. Also on the menu: Czech stuff including roasted pork loin, goulash, or chicken paprika. Along with bar foods like burgers, sandwiches and salads. Service: It was table service with a bar area that looked busy. Ambiance: Its a modern bar restaurant with flatscreen televisions and tables or booths for seating. Beer signs illuminate the blue interior along with natural light. Final Thoughts: I had only visited the Czech Village a couple times prior to the flood, so I can't say whether the places reopening here restore the neighborhood to what it once was. The Little Bohemia district was once a neighborhood with small businesses catering to people living nearby. Today it is a destination for people from other parts of Cedar Rapids or the Eastern Iowa Corridor. My next stop in this area will be Little Bohemia Bar, a place whose kitchen has slowly expanded its selections since reopening a year ago and is serving a tenderloin once again.